Libratone Lounge review | What Hi-Fi? 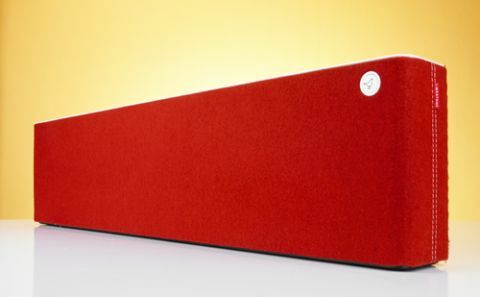 Measuring 24cm tall and 100cm wide, the Libratone Lounge is more akin to a sound wall rather than soundbar. It’s certainly one you’ll want to consider for mounting, as the extra height means you’re pretty much guaranteed to obstruct any screen that happens to sit behind it. Combine this with the Lounge’s width and this could make placing it on a shelf below your TV tricky: check the dimensions of your stand beforehand. Thankfully you’re provided with the necessary mount to help get the Libratone on a wall, together with an integrated cable-tidy system, screws and wall-plugs. It comes wrapped in a layer of cashmere – yes, cashmere – and is available in Vanilla Beige, Blueberry Black, Slate Grey, Blood Orange, Lime or Lime Green colours. The Lounge doesn’t have the most extensive assortment of sockets. There’s only one 3.5mm input, but it doubles as an auxiliary input and a digital optical connection. This means you’ll have to feed all your sources into your TV and then send sound out of its optical output (should your set have one). If you just want to connect a DVD or Blu-ray player via its optical connection you’ll need to convert all the audio onboard the player to LPCM because the Lounge can’t decode Dolby Digital or DTS soundtracks – attempt this and you’ll just be greeted by silence. On the plus side, Libratone does include AirPlay with the Lounge, keeping it in line with the company’s other streaming speakers such as the Libratone Zipp and Live. You’ll need to use Libratone’s control app to get the speaker set up on your home network. It’s a relatively straightforward case of dipping in and out of your Apple device’s network settings and making sure the Lounge’s logo is glowing the relevant colour during pairing and playback. Once connected, the app’s main use switches to altering the speaker’s sound to suit its position. FullRoom Optimization lets you tweak the soundbar’s settings depending on whether it’s on the wall, the floor or a shelf. It also allows adjustment based on how high the speaker is off the floor and how deep your shelves are – the balance of sound is altered accordingly. We found using the standard Neutral setting seemed to promote the better-balanced sound. Besides AirPlay, you can also take advantage of PlayDirect, which eliminates the need for a wireless network: the lounge creates its own. Android and Windows-based smartphones and tablets aren’t left out either. Devices can connect using the Lounge’s built-in DLNA functionality, although you’ll need to check that yours has compatible software (visit www.libratone.com/DLNA for Libratone’s own recommendations). The speaker’s lively presentation makes a good first impression. There’s a good sense of separation between the midrange and treble in quieter scenes, but the bass can overwhelm, especially when there’s dialogue mixed with action. The low frequency performance lacks definition and taints the overall sound. Even though Libratone’s website claims the Lounge is capable of a 360 degree sound experience, it never really came close for us. It pushes out a wall of sound and effects move across in front of you, but any feeling of immersion is limited. Other soundbars, such as the Yamaha YSP-4300, fare much better in their attempts to drop you into the middle of a movie soundtrack. Stream Calvin Harris’s Sweet Nothing over AirPlay and the speaker sounds up-tempo enough, with fine clarity and good detail. You can push the volume and the Lounge doesn’t harden up or sound shrill or offensive. But when the bass kicks in, the sound muddies and you lose any sense of transparency. The soundstage seems to collapse in on itself and the track loses its way. The Lounge is a large, attention-grabbing and powerful-sounding speaker. But its ham-fisted approach to movies and music lacks long-term appeal.